With the Cover Maps mapping engine, you can select an MSA (Nielsen Radio Market) and plot radio station signal coverage areas for multiple stations. This allows you to see how station signals overlap. 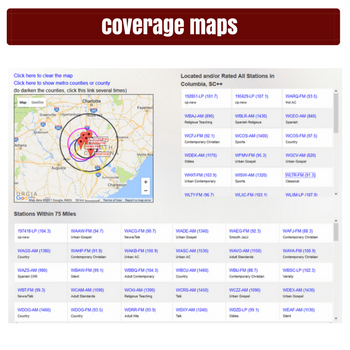 By simply clicking on call letters, you can plot a signal coverage map for a market in seconds. Please contact us in order to learn more about the benefits of having access to our Cover Maps.